NASA has started production of a plane that will fly faster than the speed of sound, but will be almost inaudible from the ground below. The US space agency plans to bring supersonic speeds back to commercial air travel with the X-Plane. But unlike its predecessor Concorde, its sonic booms will be too soft to be noticed from the ground. If all goes to plan, the piloted aircraft will be built and delivered to NASA's Armstrong Flight Research Centre by the end of 2021, and will be approved for commercial use by 2025. "It is super exciting to be back designing and flying X-planes at this scale," said Jaiwon Shin, associate administrator for aeronautics at NASA. "Our long tradition of solving the technical barriers of supersonic flight to benefit everyone continues." Commercial supersonic flight came to a close when the iconic Concorde aircraft went out of service in 2003. The Concorde's main downfall was the noise generated by its sonic boom. These booms occurred when travelling faster than 1234.8 kilometres per hour – the speed of sound. They were so loud that most overland flight paths were banned, severely limiting the plane's viability. For the X-Plane, NASA has partnered with aerospace company Lockheed Martin Aeronautics to develop quiet supersonic technology, suitable for overland flights. The conceptual design was revealed back in March 2016. Just two years later, on 2 April 2018, NASA has invested $247.5 million in a contract to make the concept a reality. 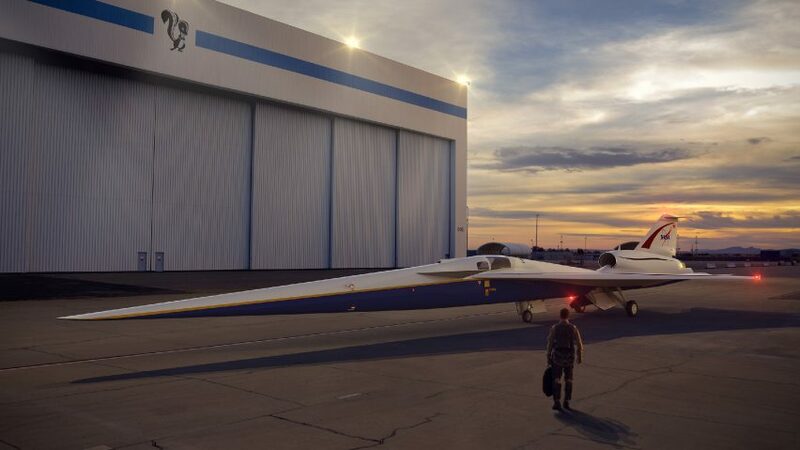 "We've reached this important milestone only because of the work NASA has led with its many partners from other government agencies, the aerospace industry and forward-thinking academic institutions everywhere," said Peter Coen, project manager for commercial supersonic technology at NASA. The X-Plane's design is based on a preliminary model developed by Lockheed Martin in 2016, but is also the product of extensive research from NASA, using results from wind-tunnel testing, advanced computer simulation tools and flight tests. Its muted sonic boom is the result of a uniquely-shaped hull – the part of the aircraft that generates supersonic shockwaves. As NASA explains, in conventional aircraft design, shockwaves merge as they expand away from the plane's nose and tail, which results in two distinct and thunderous sonic booms. However, due to the X-Plane's shape, these shockwaves are directed away from the aircraft, preventing them coming together to create these loud booms. Instead, the much weaker shockwaves reach the ground while still separate, causing them to create a series of soft, rhythmic thumps that, according to NASA, are barely noticeable. The X-Plane measures 94 feet long (28 metres) with a wingspan of 29.5 feet (nine metres). It has a fully-fuelled takeoff weight of 32,300 pounds (14,600 kilograms). The plane is expected to reach speeds of 940 miles per hour while at a cruising altitude of 55,000 feet, with a top speed of 990 miles per hour. The jet is propelled by a single General Electric F414 engine – the same used by F/A-18E/F fighter aircrafts. "There are so many people at NASA who have put in their very best efforts to get us to this point," added Jaiwon Shin. "Thanks to their work so far and the work to come, we will be able to use this X-Plane to generate the scientifically collected community response data critical to changing the current rules to transforming aviation!" Once the construction of the aircraft is completed in 2021, a series of test flights will be made to ensure that the aircraft is safe to fly and meets all of NASA’s performance requirements. From 2023 to 2025, NASA will be collecting community responses to the test flights in four to six cities around the United States. NASA also recently partnered with Uber to develop an on-demand electric aircraft taxi service, which is scheduled to begin flights in Los Angeles in 2020.